Join Donna Mather, Certified Judy Niemeyer Instructor at the GATHER Guest House, which just happens to be located right next door! Your weekend will include 14 hours of expert instruction, three delicious meals, comfortable sleeping accommodations and of course a discount on project supplies. All this and SO MUCH MORE for only $250! 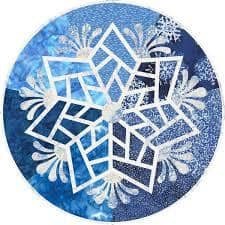 Our June retreat will feature the Scandinavian Snowflake. This is an excellent pattern for those new to foundation paper piecing and Quiltworx patterns. A sewing technique called foundation paper piecing along with applique make an excellent winter table topper. Pattern includes enough papers to make (4) 20” diameter table toppers. Space is limited to 10 students.